As Marvel’s Black Panther continues to climb the box office charts and break records right and left, it’s worth examining just what an impact the film is having – culturally, politically and emotionally – on American audiences and those around the world. This is clearly a watershed moment in film history, and its importance beyond the screen cannot be overstated. 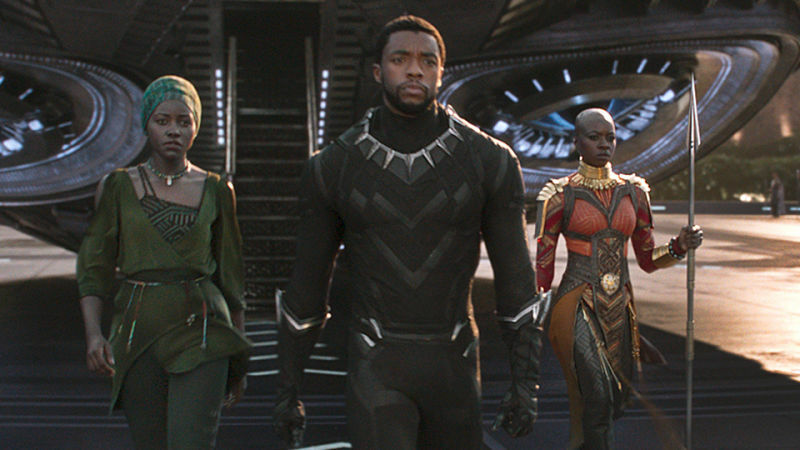 Helmed by an acclaimed young director, and featuring a spectacular, standout cast, Black Panther has added a new and refreshing chapter to the Marvel Cinematic Universe (the character and his homeworld of Wakanda were actually first introduced in 2016’s Captain America: Civil War). But it’s influence will undoubtedly be felt on the rest of cinema and beyond for years and decades to come. Before we look at some actual numbers and delve into what it all means, how about a quick recap of the film for the few who haven’t yet seen it (only basic, minor spoilers). Chadwick Boseman (42, Get On Up) stars as T’Challa, who ascends to the throne of king of Wakanda, an African country that, unbeknownst to the rest of the world, is a technologically advanced nation owing much to vast reserves of a powerful element known as vibranium. This metal’s unique properties are used to create a suit which enables T’Challa to possess excessive strength, speed and agility in his alter ego as the Black Panther. As he fights forces at home (including an American black ops soldier known as Killmonger (Michael B. Jordan (Creed, The Wire) who wish to dethrone him, he must also take on those in the outside world who seek vibranium for their own nefarious purposes. 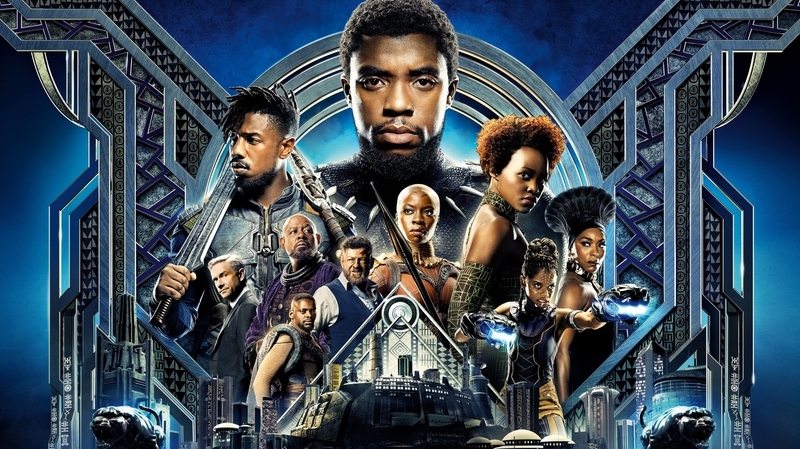 T’Challa is aided in his endeavors by his sister, tech expert, Shuri (Letitia Wright), Okoye (Danai Gurira, The Walking Dead), who leads a special force of women, and Nakia (Oscar winner Lupita Nyong’o), an undercover agent who also happens to be his ex. Together, they must protect their home country from those wishing to exploit it while also becoming more involved with the rest of the world. 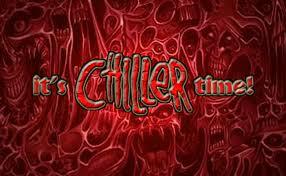 It is this story and these characters which have brought audiences to the theater in droves. So let’s look at those incredible box office numbers, shall we? It was fairly clear from early on, that Panther was poised to procure a pretty penny (how’s that for alliteration?) But as the release date drew near, it was becoming evident that something extra special was about to happen, and happen it did. Black Panther opened on Feb. 16, 2018 in the U.S. and Canada, concurrent with most of the rest of the world around that same time (with Japan and China soon after.) The numbers were staggering – $202 million over the 3 days (only the 5th film to gross over $200M in its opening weekend) and $242M over the 4-day President’s Day Weekend (2nd highest 4-day, after The Force Awakens.) After just one week, Black Panther had amassed an incredible $292M domestically. To put that into perspective, Marvel’s three 2017 releases – Guardians of the Galaxy, Vol. 2, Spider-Man: Homecoming and Thor: Ragnarok – all extremely successful and among the top 10 biggest films of the year – grossed $389M +, $334M and $315M, respectively, and those were their FINAL domestic numbers. Again, Black Panther’s $292M was after only one week! That was only the beginning. Black Panther became only the 2nd film this century (the other being 2009’s Avatar) to stay atop the box office for five consecutive weeks. 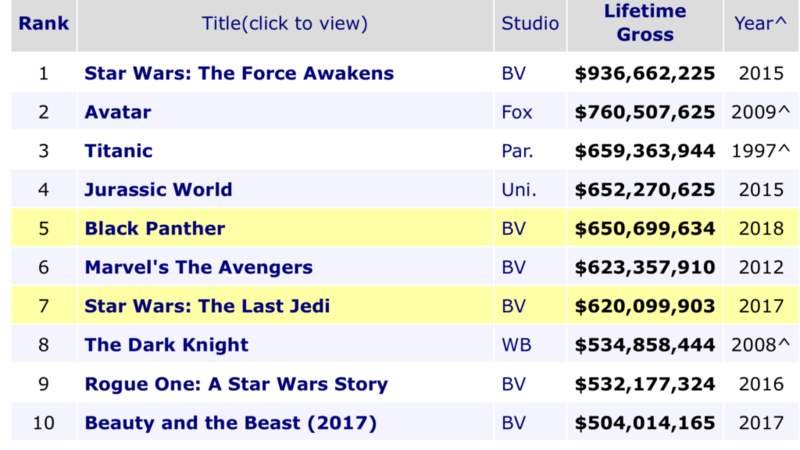 In its 6th week, Panther dropped to 2nd (behind Pacific Rim: Uprising), but in the process passed the recent Star Wars: The Last Jedi and Marvel’s own The Avengers from 2112 to become the 5th highest grossing movie of all time at over $630 million. It’s amazing that a stand-alone Marvel film could out-gross the ultimate team-up that was being set up for several years, but Panther accomplished that astounding feat. Now, after seven weeks in release, it’s even poised to pass Jurassic World and Titanic to become the 3rd biggest film of all time. Now, this is not adjusting for inflation. Here, Black Panther is still in the top 40, while continuing to climb. It always seemed the charts accounting for inflation were somewhat inaccurate – it’s hard to believe that Gone With the Wind would stand at over $1.8 billion (with a B) in today’s dollars when there are 200 million more people in the U.S. today than there were in 1939. It’s too bad the criteria for a movie’s success wasn’t always judged by tickets sold, like in sports attendance figures. Overseas, Black Panther has seen similar success, grossing an additional $600M plus, including over $100M from China, $62M in the United Kingdom, $42M in South Korea, $34M from Brazil, and over $27M each from Mexico, Australia and France. All that amounts to a worldwide figure of over $1.2 billion and counting, which places it third behind the two Avengers films when it comes to global totals for Marvel and also superhero films. Now that we’ve looked at the box office numbers, how will the massive success of Black Panther affect the future of the film industry and other avenues? And what is the impact Black Panther has had on our culture and how has it inspired people around the world? 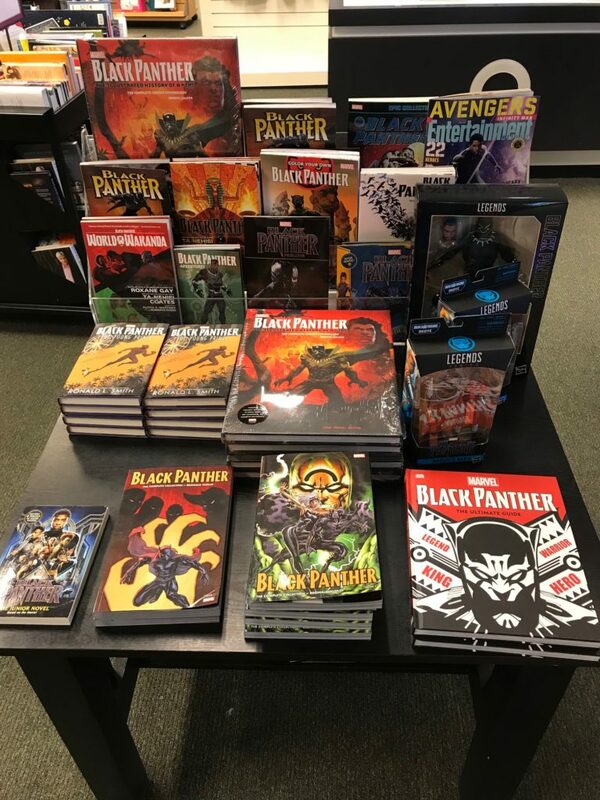 As you can see from the image above taken at a New Jersey Barnes & Noble, the popularity of the film version of Black Panther has spread to other forms – books, action figures, and of course, an increased interest in the comics from whence it came. The comic world’s first black superhero, created by the legendary duo of Stan Lee and Jack Kirby, first appeared in Fantastic Four #52 in 1966. While other black superheroes that followed – Spawn, Blade, and Marvel’s own War Machine and the Falcon, all made it to the big screen sooner, Black Panther has eclipsed them all. A movie cannot achieve the massive success of Black Panther by appealing to just one type of audience. Indeed, Panther has proven to be a crowd-pleaser across all demographics – young and old, male and female, and all races as well. That the film is especially resonating with African-American audiences is no surprise, as they are seeing a predominantly black cast in a movie of this kind for the first time, and in roles that are well-rounded and instill a sense of pride. African audiences themselves are also embracing the film, showing up at theaters in their own, colorful native garb, thrilled at the chance to see themselves represented so thoroughly and respectfully in a big, mainstream Hollywood movie as they never have before. 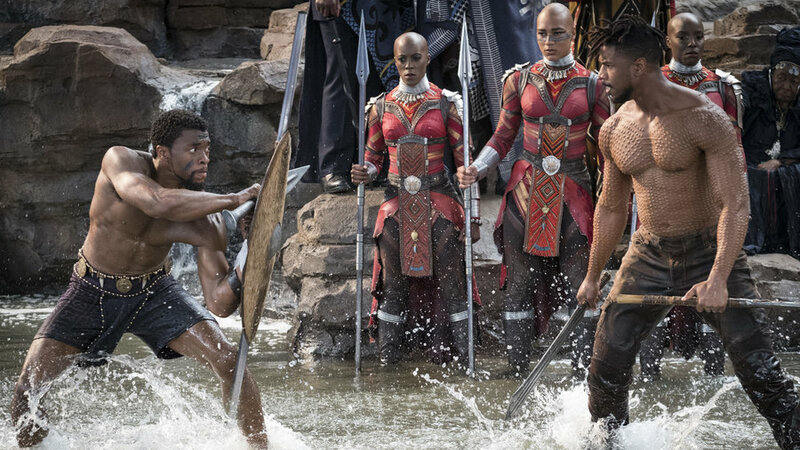 While T’Challa and his challenger to the throne, Killmonger, make up the chief adversaries in the film, it is the female contingent of Nakia, Shuri and Okoye that take the film to another level, even carrying the film for a spell while their king is MIA. These are incredibly strong, and strong-willed, intelligent, morally grounded characters that anyone could look up to. Last year was such an important year for women with the No More and Time’s Up movements, the Women’s March on Washington, and the enormous success of the film, Wonder Woman, which excited young girls from all walks of life in so many ways. Now, with Black Panther, girls are seeing several powerful representatives up on the big screen at the same time, and it must be almost overwhelming, especially for young, African-American girls. Here, we have an undercover spy, a scientist/tech expert and a warrior, though all three can be considered warriors in their own right. That T’Challa confers with them and respects their ideas and decisions only adds to their characters’ strengths. Lupita Nyong’o, as Nakia, is of Kenyan descent, born in Mexico, and already has an Academy Award under her belt (as best supporting actress for 2013’s 12 Years a Slave). She brightens every screen she is on, even when she is playing a wizened old alien in the recent Star Wars films. Danai Gurira, who plays Okoye, is of Zimbabwean descent, and is best known for her role as Michonne on The Walking Dead, an equally tenacious character. She’s also an accomplished, award-winning playwright. And Letitia Wright is a Guyanese-born, British actress who practically steals every scene she is in as Shuri. These three women, both in real life, and as their characters in the film, prove that you can accomplish much no matter where you are from, and stand as inspirations to us all. Directed by the immensely talented Ryan Coogler, who had also previously worked with Michael B. Jordan on Fruitvale Station and Creed, Black Panther, interestingly enough, began filming on January 21, 2017, the day after one of America’s darkest days, the inauguration of the current U.S. president. Coincidence, yes, but just the same, the timing couldn’t be more apt, as Black Panther showcases an advanced African nation that is the antithesis of the disparaging remarks made by this ‘president’ in referring to that continent, even though Wakanda was conceived of decades earlier. The film also serves as a direct answer to the white nationalism that has reared its ugly head, not only in America, but throughout the world. When one’s own supposed leader doesn’t have the courage or character to denounce the vile and dangerous rhetoric and gatherings of those who wish and call for the eradication of specific races and religions, we need to fight back against such hate ourselves in any way we can, be it our dollars, by marching in support of what’s right, and by voting when the time comes. It’s this latter tactic, where a movie like Black Panther can make a real difference, as groups like the Electoral Justice Project have held events at screenings of the movie to educate and register black voters. Along with the recent March for Our Lives in response to gun violence in America, come November, a particular political party may be in for a rude, and long overdue awakening. This is as direct an answer to America’s present climate and the divisiveness this current administration has stirred and openly encouraged as one can get. It is a message of progressiveness and hope, one of optimism and enlightenment. It is what we need to strive for and fight for, while standing up and pushing back against those who stand in the way. While we still have a ways to go, and hurdles to overcome, the sense is there that change for the better is imminent. Black Panther is not only a reflection of this momentum, it is also an inspiration for it. As a TV spot which aired shortly after the movie’s record-breaking debut weekend declared, “There are moments that defy a generation. This is our time.” That a movie can be a big part of such an important movement is proof of the power of filmmaking when in the hands of those with talent and purpose. Black Panther fans can rejoice in the fact that the character and others from the movie will be seen again in less than a month fighting alongside Captain America, Iron-Man and The Hulk in Avengers: Infinity War. While a direct sequel to Panther has yet to be announced, one can surely bet that one is in the works, and most likely to be released in 2021 or so. One can also expect that Hollywood, never one to ignore trends that could translate to dollars, has taken notice and will be looking to capitalize on Black Panther‘s success by searching for or developing other properties that would feature storylines and casts largely made up of people other than your standard white actors that dominate most movies. Hopefully, this will also include more strong female characters. Lastly, as Black Panther has moved and inspired people in so many ways that it would be difficult to put into words, The Tonight Show with Jimmy Fallon recently did a bit where fans of the movie did just that, voicing what the movie meant to them to what they thought was just an image of Chadwick Boseman, with their messages eventually relayed to him. Little did they know that Black Panther himself, was watching and listening backstage, ready to give these moviegoers the surprise of their lives. It’s hard not to get a little choked up at some of their responses to the impact the movie has had on their lives. Enjoy. Wakanda forever! The Conjuring 2 scares up big numbers! X marks the new Files spot!